While working in the greenhouses transplanting all day it never fails that at around 4:30pm our conversation turns to what we are having for dinner. 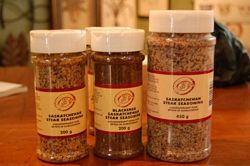 JB’s Saskatchewan Steak Seasoning is quite often mentioned. Shake or rub onto any of your favourite meats, sprinkle on soups, stews or gravies and use when making dips to add extra zip. Potatoes however, are where Saskatchewan Steak Seasoning really shines. Coat whole baby potatoes with oil, shake seasoning over them and bake uncovered until soft. Traditional flour sack towels are the best for drying glassware and dishes. Perfect as a gift for the ‘hard to buy for’ person or just a good way to remember a favourite recipe, these unique tea towels will last forever. The recipes featured on the towels are fun and easy to make. Chocolate Mousse, Pumpkin Cheese Cake and Lavender Scones are just several of the many Recipe Towels that we carry. If you loved the Onion Saver last year, which was in Katrina’s Picks 2009, then you’ll love this too! Place your pepper into the Saver and keep your peppers fresh and moist. The 2 sides attach by a twist lock to form an airtight seal, keeping out harmful bacteria that often shorten the shelf life of the pepper. Designed to look like a pepper, in red, green or orange, it will never be lost in your fridge again. 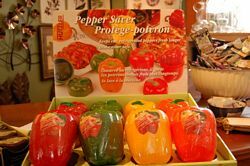 It is also a great way for serving sliced peppers at picnics or barbecues. They are easy to clean and dishwasher safe. Dryer sheets are nice in theory, after all who doesn’t want nice, soft, pretty smelling clothes? However, disposable sheets certainly aren’t the greenest option. It’s difficult to find ones that are not soaked in artificial fragrance. 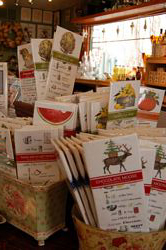 A more natural alternative would be these beautiful Dryer Sachets. 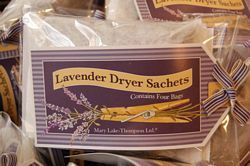 Stuffed with fresh lavender, these reusable dryer pouches can simply be tossed into the dryer with your clothes and the heat will disperse the scent throughout your laundry. Katrina used the same one until it fell apart after about 30 loads. Each package contains four sachets.